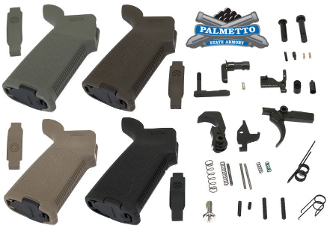 Palmetto State Armory AR15 Complete MOE Lower Parts Kit for your lower receiver. A high quality lower parts kit needed to assemble your AR-15 lower. Parts are 100% made in USA! The LPK-MOE also replaces the standard A2 Pistol Grip and the standard trigger guard with Magpul MOE (Magpul Original Equipment) grip and MOE trigger guard. Please note: depending on availability, the Magpul grip may be either MOE or MOE+ style.